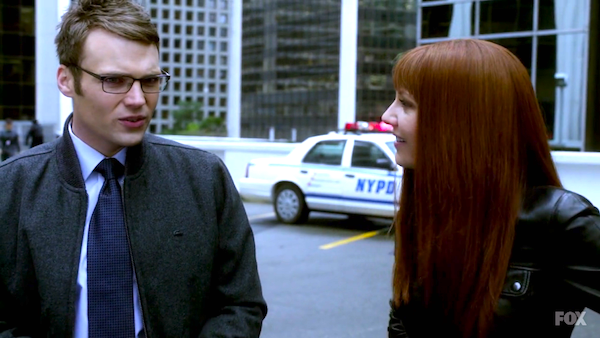 Seth Gabel and Anna Torv in "Everything in Its Right Place." Two-thirds of the way through last night's sublime installment of Fringe, "Everything in Its Right Place," Lincoln Lee (Seth Gabel) has a moment of connection to the episode's Freak of the Week, a malfunctioning shapeshifter who goes by the name of Canaan. This man, who is broken in more ways than one, tells Lincoln about the woman he loved and her son, to whom he was devoted. She left him, taking the boy, Daniel, and the shapeshifter's voice starts to break when he says, "they just went on living their lives, as if I was never there. As if I meant nothing to them." Using the current week's case to reflect on the personal trials of the characters is nothing new for Fringe, but there was something special about this week. Much like another stellar season four outing that focused on a secondary character - "Making Angels," which followed the two Astrids - "Everything in Its Right Place" made an emotional impact by focusing on fan favorite Lincoln, and looking at the many small, subtly heartbreaking ways that Peter and Olivia's reunion has affected the people around them. Lincoln's conversation with Canaan comes after he has accompanied his alternate-universe doppelganger and Fauxlivia during an investigation of a vigilante killer (Batman, to those on our side; Mantis to those from Earth 2) rather than stay at home and be forced to watch Olivia forget everything he has ever done with her. So when Canaan talks about those "unforgettable" people who "drift through life effortlessly," it's immediately apparent that Lincoln is tallying up those "bright lights" in his head. Not just Peter Bishop, who saved the world only to materialize in Reiden Lake and take Olivia from him, but others as well: his former partner and his perfect relationship with his wife; other Lincoln, whose confidence and success our hero has spent the episode trying, and failing, to explain; and Olivia herself, in both versions a woman who exerts an irresistible pull on those around her. "Everything in Its Right Place" is an episode about the broken people who populate the fringes of the Fringe universe. (Did you see what I did there?) From Lincoln's heartbreak to other Astrid's inability to communicate to Canaan, who was so desperate to do something about his situation that he turned to David Robert Jones, these characters aren't the kind who get sweeping, epic love stories or who get to save the world in the nick of time, every time. These are the people who hide in abandoned buildings or flee to other worlds because they have nothing else to do. And one suspects that those they left behind would just keep on living without them, as if they has never been there. Contrast this with Peter Bishop, the man who appeared in dreams and visions even after his existence was wiped from history, and the picture starts to come together. One of the many brilliant things about "Everything in Its Right Place" was the way the hour showcased the easy rapport between Fauxlivia and Lincoln while simultaneously reminding the audience that the charming redhead wasn't his Olivia, anymore than the newly Peter-loving version who accompanied Walter and Gene to "Grazing Day." (Speaking of which, it had been a while since we'd spent any time with Gene, and it was nice to know he was still around.) The final scene drove home that terribly sad point. Fauxlivia, her partner lost to her forever (a feeling Lincoln knows too well, as he has now experienced it two times over) knows that the smart, shy, lost man in front of her is not the Lincoln she knew, but in the way her voice breaks when she calls out his name and asks him to stay it's immediately apparent that she's wants to believe it just as much as Lincoln does. Another one of the episode's accomplishments was the way it tied the story of Lincoln to the larger mythology, both through excellent plotting - Broyles trying to kill Canaan and, failing that, presumably murdering other Lincoln - and through some hints about the larger damage that Peter's return could effect. The audience finds out that, due to the existence of the bridge that Peter created when he blinked himself out of existence, the damage to Earth 2 is reversing itself. Now, however, the man who can either save or destroy the world is back, and it wouldn't be surprising if his return has repercussions for Earth 2's new stability. Is the other universe destined to become a broken thing like Lincoln, or Fauxlivia, or Canaan? We also find out a few tantalizing details about David Robert Jones' operation. Apparently Nina Sharp is running it (if I recall correctly there is no Massive Dynamic on Earth 2 - maybe, instead of working for Bishop and Bell, the young Alternate Nina fell in with another insanely brilliant and brilliantly insane scientist, or maybe she's a shifter as well), and Canaan was one of the first prototypes of the biological shapeshifters. Alterna-Broyles is working as a mole for Jones, and one has to assume that, with Evil Nina in custody and Fauxlivia on the hunt for other Lincoln's killer, his cover is about to be blown. Even with the fantastic action sequences and serious plot movement, however, the hour really belonged to Lincoln Tyrone Lee. While I liked "A Short Story About Love," which ran two weeks ago and gave the 'shippers the Peter/Olivia reunion we had all been waiting for, "Everything in Its Right Place" made that episode look impossibly shallow and simple-minded. The story of Lincoln's heartbreak, other Lincoln's death, and the many broken people who have been trampled in the face of something as all-consuming as Peter and Olivia was a punch to the gut that had me tearing up in a few places. Peter might be unique, and Olivia might be special, but Lincoln is the new hero of the show. At least for me.